I've discovered chocolates on my own while I was researching the chocolate sites recommended in Consumer Reports You can be sure I've been all over these sites thoroughly! Okay, I confess, I haven't tasted all the treats they offer, but I tell you - I am convinced these would taste great and eventually, I hope to try them. (If I live that long). I'm just bursting to tell someone about these discovered chocolates! So right now I'll tell YOU as long as you'll read. My newest one is See's Candies. Oh, me-oh-my! Just go have a look! This chocolatier has a long history. It goes back to 1929 on the blue Danube River in Chzechoslovakia, when Leopold Grunhut was learning to make chocolates. The world war disrupted life there, so he and his family immigrated into New York, USA. 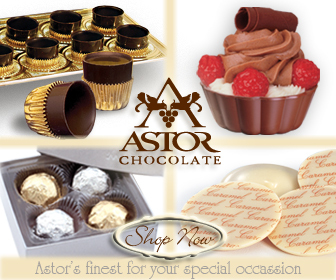 The European tradition and the styles of this family's Astor Chocolate soon won them many friends and they grew. In 1967 they started producing their chocolates in a factory, and in the 1970s they began to create personalized chocolates for various hotels. In 2000 they acquired Le Belge Chocolatier, a San Francisco based chocolate company, started by a Parisian couple, Philippe and Heugette Dumas. A visit to their website introduced me to little chocolate cups and dessert dishes. You can eat your dishes when you've finished your dessert or drink! Wow! What next? The lactose-free chocolates should be a treat for those who have avoided chocolates because of allergies to milk/dairy products. Here I also discovered chocolate greeting cards (for Mother's day, birthday, anniversaries, etc), and other clever chocolates such as love letters - which is basically the letter L in a fancy package. There are fancy tins, and other packages which include a set representing the major cities in the USA - therefore, called a Tour of the USA, and of course, many pretty chocolates and packages for special occasions. Look at what else I found! I discovered chocolates that are chess sets! The game pieces AND the box are all of chocolate. I guess when you get tired of losing you can just eat the whole game! has a network of vendors around the world, and uses a network of local suppliers to spread chocolate all over - well, at least the USA, and some parts of the world. This site is not a manufacturer of chocolates, but focuses on discovering chocolates, and distributing them in a modern and efficient way. In fact, when you key in your US postal code, you may find you are in an area where you get free shipping! (They are located in, and ship from Newton, Maryland). You can also sign up yourself - or someone else - as a gift, to the Chocolate of the Month Club. This means newly discovered chocolates can be had for a six month period or the full twelve-month year. What a thrill! Just about the time you are forgetting the delight and flavour of the last gift, another one arrives! Wow! Chocolate.com takes it upon themselves to come up with a creative new gift idea in the price range you chose when you signed up. The gifts keep arriving for the recipient, but you don't have to go shopping and hunting for something new and wonderful. That should be worth something! Aren't you glad too, for all these discovered chocolates? Here's an entrepreneur in New England who has found a way to provide excellent chocolate bars and truffles at a more affordable price. In fact, if you have a business or store where you could sell chocolates on the side, Dan would be happy to supply you as a retailer, with his chocolates. The more I stare at my discovered chocolates truffles on his site, the more I keep hankering for some. I don't normally treat myself to chocolates at my own expense, but ....hmmm! (I even find myself wondering if I could make a batch at home, even though I KNOW I don't have time to fuss with that). Meantime, in Dan's Chocolates, the bulk trays look like they contain 80-100 truffles! Oh my (sigh!) There are so many flavours and special occasion truffles it is hard to decide. You may just have to settle for an assortment or collection, on your first order. If you are in the North, East, and mid-Atlantic states of the USA, you might come across Dan's Chocolates in a Price Chopper (chain), or one of over 400 independent stores, but thanks to the internet, you should be able to order from further away, directly from DansChocolates.com. I've discovered chocolates on this site in a way that's been very educational for me. I've never seen or heard of chocolate fountains before, but here I watched videos that show exactly how to assemble and use their fountains, and how to takem them apart too. They have basically four commerical models and three for smaller scale home-use. You may buy or rent them. If you already do catering or serve food, as in a restaurant, it would be well worth your while to buy one as you can charge customers for the items held under the flowing curtain of melted chocolate, and you will soon have earned enough to pay for your model and give you a handsome profit! Of course, you will need good quality chocolate melts and if you plan to make chocolate candies, Sephra offers all these supplies for sale from their website too. The chocolate melts are the best quality Belgian Dark Semi-Sweet Fondue Chocolate straight from Belgium, but they have good milk chocolate and white chocolate as well. These melts come in 2 lb bags, which are the quantities the fountains need to operate. The number of bags you'll need, naturally depends on whether you are serving 20, 40, 80, or anywhere up to 200 guests. Guests! Right! 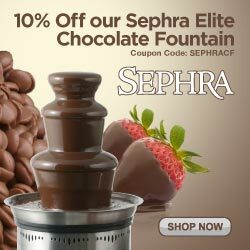 If you are planning a wedding reception, you'll want to check into renting a chocolate fountain from Sephra. Your guests will have so much fun and never forget your reception. Actually... this is a great idea for any kind of party! Haven't you discovered chocolates turn just any occasion into something extra special? So? Have you discovered chocolates that I missed here? Are you prepared to share? :) Which ones do you recommend most?